The US Mint produced their first commemorative coin in 1892 to help fund and to celebrate the 400th anniversary of Christopher Columbus discovering the New World. On August 5, 1892, Public Law 52-203 granted the authority to the Director of the Mint to produce up to 5,000,000 Columbian Exposition half dollars to help fund the World's Columbian Exposition in Chicago. The law stated, "said silver coins shall be manufactured from uncurrent subsidiary silver coins now in the Treasury, and all provisions of law relative to the coinage, legal-tender quality and redemption of the present subsidiary silver coins shall be applicable to the coins issued under this act, and when so recoined there is hereby appropriated from the Treasury the said five millions of souvenir half-dollars, and the Secretary of the Treasury is authorized to pay the same to the World’s Columbian Exposition..."
In addition, the law required the Mint to be reimbursed for recoinage expenses: "the sum of fifty thousand dollars, or so much thereof as may be necessary, to reimburse the Treasury for loss on the recoinage herein authorized." The coin's estimated value ranges from $16 (low grade - XF) to $850 (high grade - MS-66). 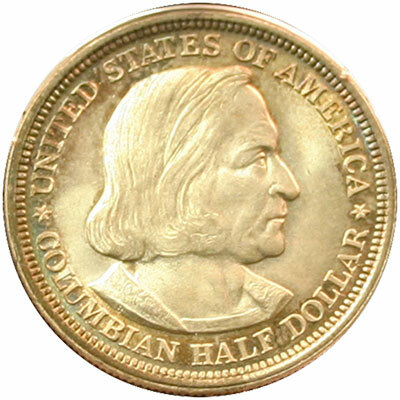 The obverse or front of the first classic commemorative half dollar coin shows a portrait of Christopher Columbus with him facing to his left and to our right. The words "United States of America" show around the upper half of the coin. Along the bottom are the words "Columbian Half Dollar." Two stars, one on each side, separate the two inscriptions. Olin Lewis Warner designed the portrait of Columbus for the coin's obverse. Charles E. Barber, Chief Engraver of the US Mint at that time, engraved the design to produce the coins. The reverse or back of the coin shows a ship under full sail in the ocean. The design represents the Santa Maria, Columbus' flagship. By today's standards, the Santa Maria was a small ship. She was roughly 58 feet long and 100 tons. The sailors in the expedition called her Marigalante, Spanish for "Gallant Maria". 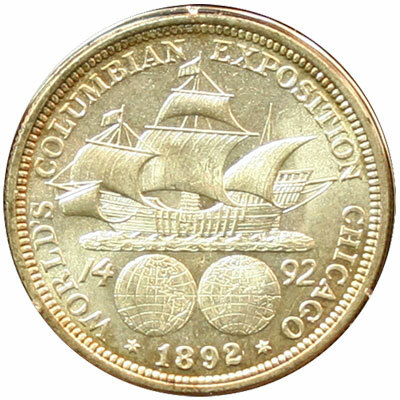 The words "World's Columbian Exposition Chicago" flow around the design on the coin with the year shown at the bottom. Below the sailing ship are two globes showing the eastern and western hemispheres. The two globes split the year "1492," widely recognized as the year Columbus discovered the New World. Olin Lewis Warner also designed the coin's obverse, and George T. Morgan engraved the design for the coin's production. Though the allowable mintage was 5,000,000, less than one million were minted in 1892 and less than two million in 1893. Roughly 2,500,500 of the coins, or just over half of the allowable mintage, were distributed. Chicago hosted the World's Columbian Exposition in 1893. The dedication ceremony occurred in October 1892, but the Exposition did not open to the public until May 1893. From May through October the roughly 600-acre fairground saw more than 27 million attendees. The World's Columbian Exposition half dollar coins were sold at the fair for $1 each. Interestingly, the 1892 coins have a lower mintage, yet the 1893 dated World's Columbian Exposition half dollar coins enjoy a higher value. Visit our GACS Numismatic Shoppe World's Columbian Exposition for a variety of useful items decorated with images of the classic commemorative silver half dollar coin.